SIIG's Serial ATA PCI host adapter is an ideal solution for expanding your SATA storage capacity to your desktop computer. It is designed to add two SATA channels for connecting up to two additional SATA hard disk drives. The Serial ATA PCI host adapter delivers data transfer rates of up to 1.5Gb/s and breaks the barrier to support hard disk drives larger than 137GB. It comes with two independent bus master DMA channels with 256-byte FIFOs per channel for host reads and writes and flash memory BIOS making future upgrades possible. It can be configured as a boot or secondary controller and co-exists with on-board Ultra ATA controllers. 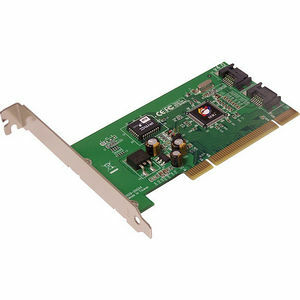 This 2-channel Serial ATA host adapter is powered by Silicon Image chipset and is fully compliant with industry standards, including Serial ATA Specification, Revision 1.0 and PCI Specification, Revision 2.3. It also carrries FCC Class B (DoC) & CE regulatory approvals and is RoHS-compliant. The Serial ATA PCI host adapter comes with a thin, flexible Serial ATA cable for user-friendly installation and better air circulation, a 15-pin SATA power cable, a driver CD and a comprehensive user's manual. It is fully compatible with a wide variety of Windows operating systems and is backed by SIIG's limited lifetime warranty.